If you're anything like me, you'll have been glad to see the arrival of 2015. Those that know me will know that 2014 was a really tough year. Due to changes and commitments with Little Hippy I've really had to take a back seat with Stampin' Up! which has been as sad as it has been frustrating. I haven't had time to do my daily updates on here and I haven't been able to commit to regular training with my lovely Stampin' Up! girls. However, I am glad to annouce that I'll be going back to it full time (yes, FULL TIME!) in July. Exciting times ahead! Little Hippy and I are also going on holiday this year! We are going to Cyprus for eleven whole nights which I'm really excited about. I keep pinching myself, but it has been booked (so I can truly believe it's happening!!) and it will be a much needed rest for both of us. We are going with my parents, I am so looking forward to spending some time with them! So what of Stampin' Up! news?? Well, it is currently SALE-A-BRATION! That means a freebie for every £45 you spend until the 31st March 2015. And the Spring Summer catalogue is also here. There are links to both on the left hand side of this page. 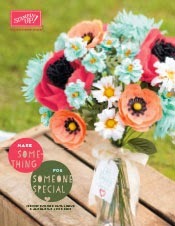 The Sale-a-bration brochure shows the free stamps, paper, and blendibilities that you can choose from as your free gift. There is no limit to the amount of freebies you get, so if you spend £90 (for example) you will get two. If you spend £150 you will get three freebies, plus your £25 free hostess pounds for spending £150. Please don't hesitate to get in touch with me if you have any questions. I'm wishing you all a fantastic and crafty 2015.